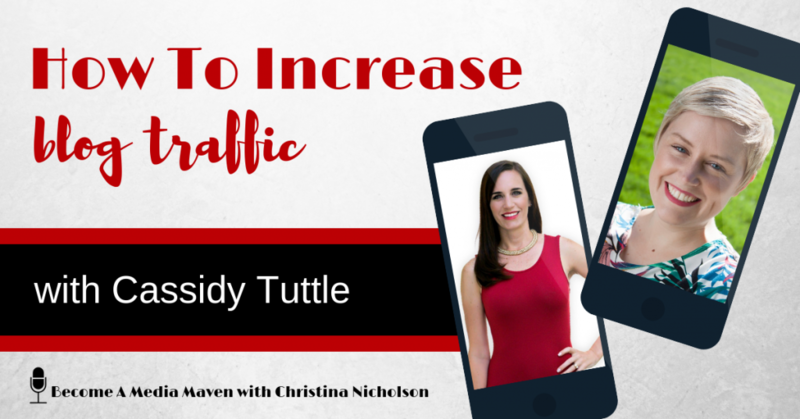 In this episode of Become a Media Maven®, Cassidy Tuttle is showing us how to increase blog traffic. What started as a photography blog quickly turned into a niche website with hundreds of thousands of people finding it organically monthly. In the 15th episode, Cassidy is going to walk us through how she realized she was getting this traffic and how her hobby turned into a thriving business when she took a strategic shift after seeing a little bit of what was possible. Cassidy Tuttle runs the website Succulents and Sunshine where she teaches people how to grow succulents. So, how did you start doing this, what were you doing before you started this website, and when did you start this website? Before I started the website, I was actually doing food and product photography, and that’s what my background is in. I have a BFA in photography and I started a photography blog because, you know – five, six years ago, that was the thing everyone was doing. I bought a few succulents and I started posting about what I was doing with them on my photography blog, and then when I found out you could make money online or through a blog, I put analytics on the site and realized no one was coming to my photography. They’re all coming to my succulent posts, which were basically just like, ‘hey, here’s what I’m trying this week, and apparently, you can propagate these from leaves. So, I’m trying this and this’, you know – it wasn’t anything super exciting. At least not that I thought, but no one was writing about it online at the time. So, this was about six years ago, and then I made a really conscious switch to take all of that succulent stuff and put it on its own website, because – especially at the time, it was a really big deal to have your keyword in your URL, and that still helps for search traffic. But people were spamming it, so it’s less of a ranking factor now. But I switched it all over to Succulents and Sunshine, and I cleaned up the posts and made them a little bit more instructive and more like a tutorial, and basically just haven’t looked back. We’ve just continued to post new content and share new things. I started doing a little more, like real research and kind of some experimenting, and just documenting it all on the blog, but then also making sure I was actually following good SEO practice and all of that online business awesomeness. I believe I bought the Succulents and Sunshine domain name in 2013. It was on Valentine’s Day. So, you did this just by basically going into your Google analytics and seeing what people were responding to, and you said, ‘hey, I think I found the needle in the haystack keyword situation, so I’m going to capitalize on this’. Is that how that worked out? Yep, exactly. So, I knew that I wanted to get organic search traffic, so when I put analytics on the site and I saw I was already getting some without trying, I knew that I could do a lot better if I actually put some more effort into it. And the keywords we were ranking for at the time were not big. I think back then, one of the keywords we were ranking for was propagating succulents, or how to propagate succulents. And it was getting two to 300 searches a month. Now it’s gone up, because succulents have taken off, and a lot more people are searching that. But it wasn’t a huge keyword, and that was the thing that actually would still be my approach now, is picking a keyword that’s smaller, because most people aren’t going to be targeting it, and then building out from there. I don’t do as much of this as I used to because our site is big enough that we do tend to just rank for a lot of things. But right now, we’re approaching – we want to kind of branch out, and we want to start ranking for individual types of succulents. So, the actual species names – some of them that you guys might be familiar with would be Aloe Vera, which is humongous. Then string of pearls, or things like that. What I’ve been doing is I’ll just go do a Google search for the word that I want to rank for, and there’s a Chrome extension called Keywords Everywhere, and it is the best thing ever. It will show you how much search traffic a keyword is getting each month. And if you’re just starting out, or if you’re approaching a new topic, I usually recommend starting with a keyword that’s getting around a thousand searches a month. It’s enough that it will generate some traffic for you, but not so much that it’s going to take forever to rank for it, or that there’s going to be a lot of bigger websites trying to compete for it. I know a lot of people will pay attention to – there’s a competition number out there, and the cost per click number, which those are all for advertisers. So, if you were going to pay for that keyword, if you’re going to pay for an ad to show up there, that’s roughly how much you’d expect to pay. And then the competition basically tells you how many people are competing for that keyword for ads. So, I don’t feel like it’s super, super helpful. You can look at it and be like, okay, there’s a lot of people paying for ads, so it might be something that I’d want to rank for. But basically, I’m just looking at Keywords Everywhere and finding something in that thousand, maybe up to 10,000 range. You can do lower than a thousand, but I feel like it’s not quite enough traffic to make it worth it. But if it’s 800 or 900, go for it. So, I started searching for ‘how to pot a succulent’. That came up with some very different articles that I would probably want to be ranking for. It kind of got stuck on ‘how to pot’. But what I realized was the phrase that people are actually searching for was ‘how to plant succulents’, and that got a lot higher search traffic. So, make sure you’re looking at different ways of saying things, because even though they will have a similar search result if you can get it the way that most people are searching, you’re going to do a lot better. From there, once I have that keyword, then I go and write my post. I have that keyword, and related – and keyword also being a phrase, right? ‘How to plant succulents’, would be a whole keyword. That whole thing’s a keyword. And then I would go write the blog post, keeping that keyword in mind, but not necessarily trying to stuff it in exactly. I really write all of my content the way I talk, and in a way that flows and makes sense. And that’s my very first goal, is having a really good article that sounds normal and makes sense. Then afterward, I’ll go back, and as I’m editing, if I notice something that’s similar to my keyword, sometimes I’ll switch it. If I said, ‘if you’re looking to plant your succulents’, I might switch it to say, ‘if you want to know how to plant your succulent’. It’s just making those little tweaks to get that keyword in there. But Google’s pretty smart these days. They can usually tell if it’s close enough. I do also use the keyword in my title, and then also in headers. So, in every blog post, we’re actually going back and updating old posts. But you want to make sure you have sub-headers and use the keyword or some variation of it in a header. One of the posts we get the most traffic to is ‘how to water succulents’. So that’s the name of the blog post, the title. But then I have a couple of sub headers that say how to water succulents indoors and outdoors, and the subtitle still makes sense. It doesn’t feel super obnoxious, or like I’m just using that phrase over and over. And then I have another header that will be like, ‘watering succulents indoors’, or something like that. So, a little bit of a tweak, where it’s not exactly that phrase. And then my secret weapon, I feel like, is images. So, before you even upload a photo to your website, you want to name it with your keyword in the file name. For that watering post, the main image that we have at the top of the post will probably be named something like, how to water succulents indoors and outdoors. So, I’m getting as many of my keywords in there as I can. And then when I upload it, I copy that same information and put it into the ALT text, which – in theory – is what would show if the image doesn’t load. But Google can read it, and they can read your file name, too. 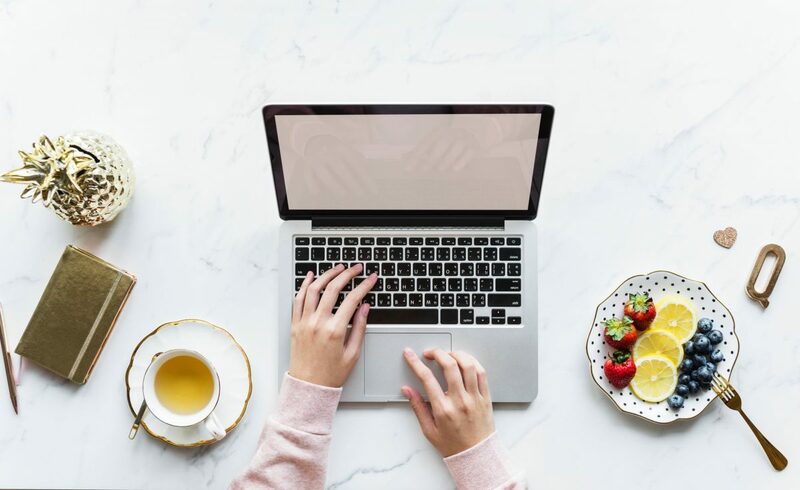 And that, for me, I think has been one of the main reasons why I’ve been able to generate so much search traffic, is because my site is so image heavy, and I think that’s something that a lot of bloggers and businesses don’t necessarily think about. I have 10 images in a blog post, and most of those images are using some variation of the keywords that I’m looking for to rank for. It’s kind of like a little extra credit in your SEO to have a bunch of images that are also telling Google, ‘hey, this is what this blog post is about’. And honestly, it’s really just those couple things that I’m focused on: the title, sub-headers, and then the images. And then making sure, naturally, I have the keyword somewhere in my post. Then the other thing that is actually big now is having it be a long post. And I definitely have seen this more, where posts that are 500 words or more are definitely ranking better than shorter posts. A lot of people will even say a thousand words or 2000+ words is going to be the best length for your post. But you also want to make sure that you’re not just writing a super-long post just to make it super long. You want to actually provide a good reading experience as well. I have not paid for a keyword tool for years, and I’m doing all right with search traffic. I love Keywords Everywhere because it is free, and it honestly provides as much information as you need to know for the most part to make a good post or article that’s SEO friendly. And I like how you write content the way you talk. Coming from TV news, that’s how we would write our stories. It’s all the way you talk. And that’s the way you Google things, too. You Google things the way you talk. You also touched on how Google is liking the long posts. Before, it was post at least 300 words, and do it more frequently. But now, it’s just, post something good and we’re going to go with – maybe if it’s longer, it’s better, because there’s more information in it. So, they’re liking the long posts, and for that reason, I’ve started taking these podcast interviews. I get them transcribed, I give them to my assistant, and she turns that transcription into a blog post with those subheaders and getting a keyword in the title. The only thing that I really need to step up – and you’re reminding me – is getting that extra credit. Which, I like how you put that: extra credit in your SEO by getting more and more pictures there. Now you are in a very visual space. You’re talking about succulents. But what if there is somebody who isn’t in a very visual space – what would you advise they do to get those pictures with keywords in their blog posts? It doesn’t technically have to be a photograph. Using screenshots, you know – if you’re uploading that, that’s going to be an image. Really just any sort of relevant visual that you can add. I know people feel like, ‘oh, I’m writing about something that’s super technical, there’s no way I can add an image’. Well, you could add an image of a happy person, or you know – just something that does relate to some extent. Or create a quote card. Right? A lot of people will do a pull-out quote. Do it as an image instead. Then it’s shareable on social media, and Google can read it as an image so you can show up an image search. So, I think you just have to be creative. Just think of anything you can create that would be an image file – text screen shares, stock images – and having just two or three in your post would be huge. Our traffic fluctuates pretty substantially throughout the year. May is when our traffic peaks, and then we usually bottom out around December. In May, I think this year, we got up to where we had about 500,000 visitors in a month, and now we’re down to probably about 350,000. So, it’s a pretty big swing, but I’d say on average we’re getting 400 to 450. And the awesome thing is – because the interest in succulents is going up and we’re also producing more content – year over year we’ve seen at least a 10-20% increase in traffic. Right now, we’re at a pretty even split between display ads. That income is awesome because if you have traffic, you’re making money. You don’t have to do extra work on top of the traffic. And then we do a lot of affiliate products. We have a couple places that sell succulents that we’re an affiliate for, just like Amazon and Etsy. We also have a course and eBooks that we sell. So, in this month, it’s almost an even split between the three of them. But then depending on the time of year, like November, December, our affiliate income will probably go up a little bit. It actually also goes up in May, because succulents are our biggest affiliate. So, that will go up then, too. So, just any combination of those three things is how we’re making money. At what point did you realize – I’m assuming you’re educating yourself about SEO a little bit and learning some tricks and tips and strategies – at what point were you like, ‘okay, I can actually start monetizing this, because I’m getting a lot of traffic and people are finding me’, and what did that look like? I started monetizing within a month or two of having this site up, because I was convinced that it was going to be this huge moneymaker. So, even when I was getting just a hundred page views a day, I had Google ads on there, and I think the first time I made $100 in a month – which was their threshold for paying out – was about a year later. But I also didn’t really know what I was doing right when I started, but I was making something. I would get $25-50 a month. And it was actually shortly after I moved over to its own website that I found out about eBooks, and I created an eBook as one of my very first monetization strategies. I didn’t feel like it was a super good launch at the time, but when I went back and looked at the numbers the first month we published the eBook, I think we made almost a thousand dollars. And at the time, I was reading things like, ‘oh, we’re going to have this $10,000 launch, and I’m like, Oh man’. People say that, but they don’t tell you that they spent $9,000 on the launch, so they really profited a thousand. So, I think you’re still good. Yeah. And especially because I didn’t know what I was doing. I think the only email list I really had was actually just the RSS feed. I’m pretty sure I just published a blog post that said, ‘hey, I’ve got this new eBook, and that was essentially my email launch. That’s all I did. I didn’t have an official email list at the time, so all things considered, looking back – it was a really good launch. So, would you say your monetization, I guess your roadmap, was you started with display ads, then you went to an eBook, and then you went to affiliate products, and then maybe after that, you created a course? And since that very first eBook, I’ve created several more since then. We have four that are kind of our core eBooks, and the course has now been out for two years. So, it’s been a while. And I really didn’t pick up on affiliate marketing until about three and a half years ago maybe. I took a course on blogging and she started talking about affiliate marketing – and at the time, I had Amazon ads, but that was it. And I’m like, ‘oh, I should really be looking into this. I need to find somewhere that sells succulents because that’s really what people want to buy’. So, I started with Etsy, and then eventually – because people will sell succulents on Etsy – and then I eventually reached out to some different online succulent stores, and now we have partnerships with a few different online stores. So, on the surface, it looks like you’re in the succulent business, but I feel like as we dig deeper, you’re really in the content creation business, and that’s how you get your money and your customers and your visitors and all of that. So, you’ve really become not just a succulent expert, but a content creation expert. Yeah. And honestly, it’s funny. When we talk to different neighbors and they’re like, ‘oh, so you guys sell succulents?’ ‘No, we don’t. We just teach people how to grow them.’ It’s so confusing to people. I’m like, I know. It’s just how it is. But yeah, you’re absolutely right. It’s all about content and information and just helping people learn. And we happen to be doing it with succulents. So, have you learned to love succulents more than ever now that it wasn’t just a one-off thing? Like, here, I’m going to take pictures of my succulents for my photography blog. Now you’re really in it. Yeah. We’re really in it. My love for succulents comes and goes. I’m not going to lie. I published a book three years ago, and after I wrote the book, I swore off succulents. I’m like, I will never touch one again. And then a month later I was back at it. So, it comes and it goes, but it always comes back. But it is really fun and it’s something that I enjoy. It’s something I can do with my kids, which has also been fun. If you ask my four-year-old what he does, he’ll tell you he works at Succulents and Sunshine. He waters the plants. And I bought a succulent for my birthday one year and he was with me when I bought it. And he’s like, well I want a birthday succulent. So, he got one too. And now he can spot it if we’re driving around or walking around and he sees one. He’ll be like, that’s my birthday succulent. So, that’s awesome. Oh my gosh. I was just at the store last weekend, and I saw – now I cannot see a succulent and not think of Cassidy. Every time I see a succulent, I just think about you. And I’m like, ‘Oh, if I ever needed to know how to keep that thing alive, I would know where to turn.’ It’s so funny. So, on the fourth episode of this podcast, I had Amy Landino on, who is an amazing YouTuber who teaches people how to make money on YouTube and how to grow their YouTube channels. Since you are in the content creation business, YouTube is something that you are dominating, especially lately. You just hit 10,000 subscribers. So, tell me a little bit about your strategy on adding YouTube as a source of getting more people to your website. I’m really glad you asked that because that is actually something that is also helping our site SEO as well. Basically, our strategy was just to take all of our top-performing blog posts and turn them into videos. So, if you watch the videos on our YouTube channel and then you go and read the blog post, you’ll be like, oh, this is almost identical. Not all of them are, but we followed a really similar approach to the YouTube videos. And once the videos go live, we’re emailing them out to our list, which helps generate traffic. And we were also embedding them in the related blog posts, and that’s helping YouTube realize that, oh, these videos are worth showing people, because they’re getting views elsewhere. It’s helping to increase our time on page on the website, which also helps with search rankings. It’s one of those little factors. And then – it’s all kind of a happy way of helping each other. So, I think that’s been the way that our YouTube channel has really grown, is from having the videos embedded on these really high-traffic blog posts. It’s giving YouTube good signals, and then YouTube will start showing us more in related content. And something that I love about you – and you’re probably tired of hearing it because I tell you every time we talk – is that you are so good at being super strategic and doing one thing at a time until it’s successful, and then moving to the next. There are so many people who want to start a blog, and then they want to start a YouTube channel. But you did your blog, it was super successful, and now you’re doing YouTube. But you’re using your blog to tell you what to make videos of, and that’s why you are also successful on YouTube. You’re just so strategic about everything and you take your time, and you’re very thorough about every single step that you take, and I think that’s why you have been so successful in this crazy niche that you’re in. Now we’re also kind of in this spot where we have a massive audience, and they’re essentially telling us what they want to see, which is a huge, huge deal. That’s something that is hard when you’re starting out: you don’t necessarily have the audience to say, ‘Hey, I was wondering how to drill a hole in the pot that I’m going to use for my succulents.’ You know, you’re not getting those questions. So, that’s something that we’ve really taken advantage of – looking at the traffic, seeing what is working on the website, and also just asking for input from our audience. And we actually started a series last fall. It started because I hadn’t planned ahead. We had this Facebook group, and I’m like, oh, I don’t have anything to share in my weekly email. So, I’ll just ask people in the Facebook group what questions they want to be answered. And I answered 10 questions in one email. It was so long. It was a crazy email. But people loved it! So, we took that and we started this FAQ series, where we started out with five, and then we trickled down to two – and we’ve shifted gears since then a little bit, but we would answer a question every week, and we turned it into a blog post. And I would not say that that has been a complete game changer for the website, but those faqs are now finally starting to rank in Google, and we’re getting an extra two to 3000 page views a week from those FAQ, whereas we wouldn’t have had them before. So, it’s been awesome to be able to have the audience to pull from, and to just take what they’re giving us and run with it. I want to switch gears and talk about your new passion project – which is like, a side thing, something that you’re doing for fun. But you’re a genius in this. I’m sure you’ll find a way to monetize it later down the road. Can you tell us all a little bit about that and what is coming? Show Me the Good – is that what you’re thinking of? So, I just had this overwhelming feeling or impression that I wanted to share people’s little stories about doing good things because I hate watching the news. I don’t watch the news, I don’t listen to the news, I don’t read it. I’m probably one of the most sheltered people because I just don’t want to see what’s out there. And so, this friend who just had a baby six weeks ago brought me dinner. Didn’t change my life, but it was so nice, and now we’re addicted to a new brand of tortilla chips, you know? It was just something that – I don’t think it was actually a big deal to her, but it was a huge deal for me. And I just want people to feel like whatever little thing they can do, whatever way they can serve the world, is worthwhile because I think that’s something that’s missing. We see all these huge humanitarian projects or things like that, but really, just calling a neighbor and asking how they’re doing, or just something little, can have a huge impact on someone’s life. And that’s what I want to focus on, is just sharing little stories of people doing good things, and just having a good news outlet.